This was often exposed though, as Bravo would find the longer diagonal pass through the air and into the open Mendy for City to progress forward. Mendy was able to move past Cesc on the wing and pass into his attacking midfielders who could then switch the ball against the very compact defense for direct dribblings on the wing. 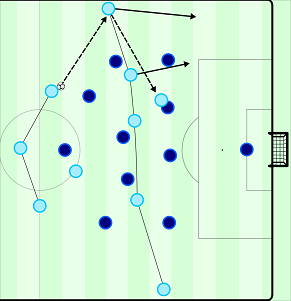 As the game progressed Pedro became more patient and waited for Laporte to receive the ball first before pressing onto him, therefore more effectively covering Mendy and more frequently forcing long balls. Morata positioned himself on Fernandinho and then would either press John Stones or maintain his man-marking on the defensive midfielder. This depended on the distance of the central midfielders of Chelsea, as it was normally their role to press out of midfield and toward the central defenders while Morata covers the middle. 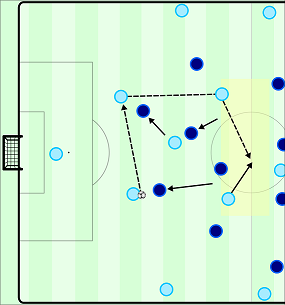 Once the ball was forced back to Bravo, Pedro initially looked to press out high and early onto Laporte off of Mendy in order to prevent the goalkeeper from playing a simple short pass to the open central defender. ity’s circulation improved in the back line as they began to pull out Chelsea’s central midfielders with more patient circulation. During the 2nd half where Mahrez was moved to the left wing, Mendy began moving higher up the wing (previously occupied by Sane) while Walker remained deeper. 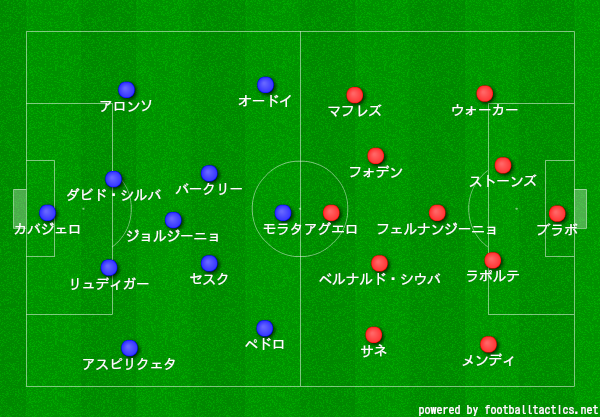 This formed a sort of 3-1-5-1 formation with 3 attacking midfielders and Mendy and Bernado on the wings. The back 3 in possession made it more difficult for City to expose Chelsea’s pressing as well as they did in the back 4, but it was an interesting variation to see – it is likely that we see this back 3 system more often this season should Mendy remain healthy.